This Irish welcome wall hanging features Céad Mile Fáilte and it would be ideal to hang above a door. The Céad Mile Fáilte greeting on this Irish welcome wall hanging is a hundred thousand welcomes in Gaelic. 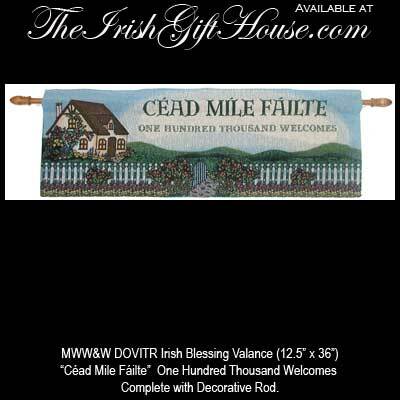 The Céad Mile Fáilte wall hanging will warmly greet your friends with the traditional Irish welcome. This welcoming wall hanging from The Irish Gift House measures 12 1/2" tall x 36" wide and is ready to hang with the included wooden decorative rod. This Irish blessing of one hundred thousand welcomes has a 65% polyester/45% cotton covering and a 100% cotton backing and it is made in the United States.